The University of North Texas Press has published a new book titled, "Graham Barnett: A Dangerous Man" written by James L. Coffey, Russell M. Drake and John T. Barnett. This book is the absorbing story of an early twentieth-century west Texas lawman who earned a fearsome reputation as a gunman with a badge by killing a number of men in drunken rages. Barnett was tried and acquitted twice for murder before he met a bad end when Upton County Sheriff Bill Fowler shot him full of holes with a Thompson machine gun at Rankin, Texas in 1931. Born in 1890 Graham began his lawman career when he signed on as a Texas Ranger in the spring of 1916. He served under Ranger Company B’s infamous Captain J. Monroe Fox now forever remembered as the Texas Ranger Captain who ordered the horrific Porvenir massacre in January 1918 during which a group of Company B rangers assisted by Eighth Cavalry troopers of Troop B shot and killed fifteen innocent Hispanic farmers in far northwest Presidio County. The “dangerous man” writers including Graham’s own grandson, John Barnett, speculate that Graham did not take part in the massacre. Inexplicably, however, they disclose to their readers that Graham’s own brother, Boog, also a Texas Ranger in Company B during those years, claimed that “he and Graham were both present” at the massacre. No reference is cited in this curious admission however the writers incorrectly state that the massacre happened in December 1917. The Porvenir massacre did not occur in December 1917 but actually went down in the early morning hours of January 28, 1918. Having researched the massacre for many years I have to agree with the “Dangerous Man” creators that previously I have not found Graham or Boog Barnett’s names associated with the massacre but because of this odd admission I must add it to my list of possibilities and keep looking. With reference to the authors claim “That sounds like something ole’ Graham Barnett would do”, I whole heartily agree. 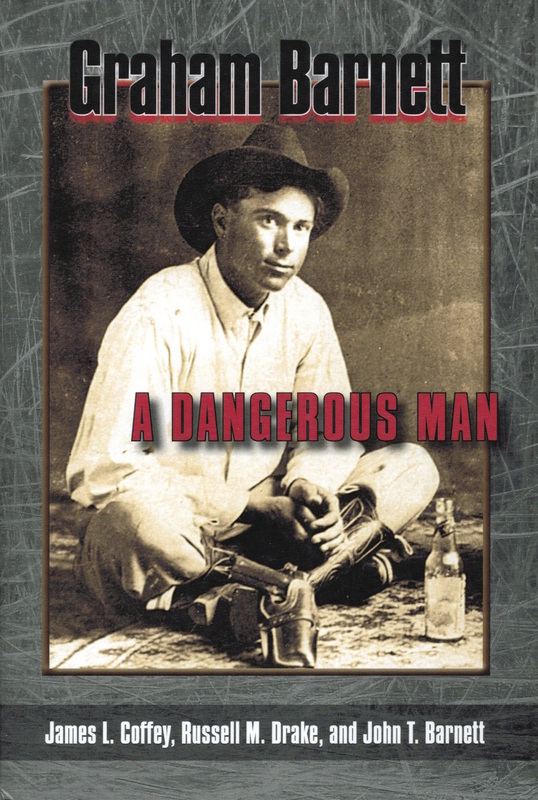 Overall, “Graham Barnett: A Dangerous Man” is a very good historical study in addition to being a most interesting and readable work. It finely details the life of one of the more prominent Texas Ranger gunman who emerged in the early twentieth century. Also, this book is an interesting look at how west Texas law enforcement changed and evolved as the Texas oil industry first brought prosperity to the state and its people. 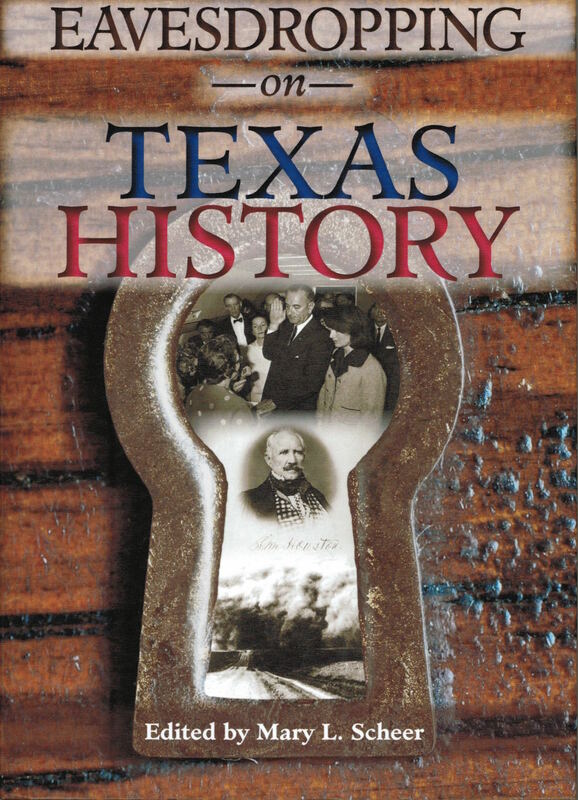 I highly recommend this book to anyone interested in Texas history. The University of North Texas Press recently published a thought-provoking new book titled “Eavesdropping on Texas History”, ISBN #9781574416879, 342 pages. Editor Mary L. Sheer posed an intriguing question to fifteen recognized Texas historians by asking, “At what point in Texas history would you have liked to have been a ‘fly on the wall’ and why?’ ” Each of these scholars responded by submitting their answers in the form of an essay that when combined make up the book. “Eavesdropping on Texas History“ offers a varied collection of historical topics each written by an expert on the subject. The articles are diverse and well documented using both primary and secondary sources covering Texas events taking place between 1811 and 1967. Some of the more notable subject matter includes, Stephen F. Austin, the fall of the Alamo, Sam Houston,Cynthia Ann Parker, the Dust Bowl and Lyndon Baines Johnson. The well-documented notes of each of the authors demonstrate the research difficulties encountered by most historians in dealing with conflicting and flawed accounts, as well as lost, missing and poorly written documents. The fifteen writers are made up of two State Historians of Texas, two former presidents of the Texas State Historical Association, four current or past presidents of the East Texas Historical Association, two former presidents of the West Texas Historical Association as well as two Fulbrite scholars and seven award winning authors. Mary L. Sheer is professor of History and department chairman at Lamar University and a Fulbrite Scholar to Germany. She wrote “Women and the Texas Revolution” and others. “Eavesdropping on Texas History” is a fine and interesting read that should be enjoyed by a wide number of readers who love Texas history. 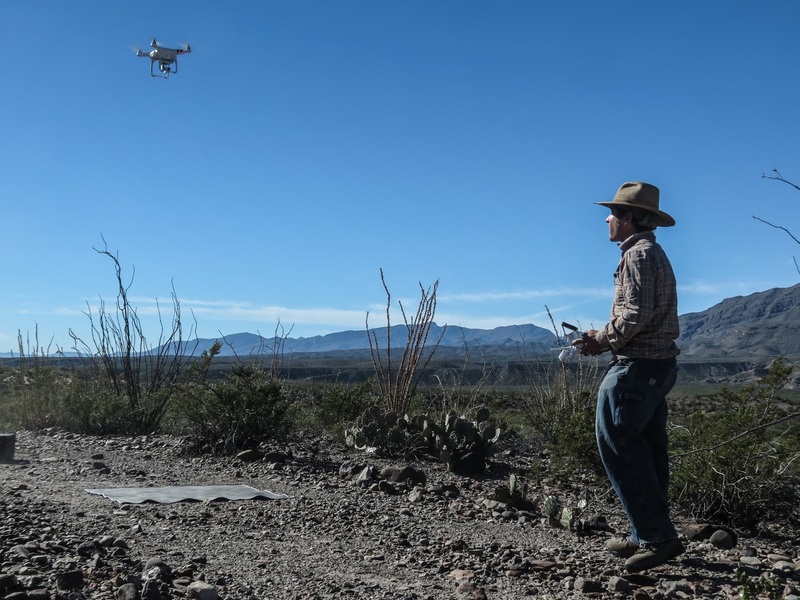 While many know about the Trans-Pecos Pipeline project in the Big Bend few realize that it is poised to destroy untold numbers of archeological sites in its path. Just as Energy Transfer Partners have shown their disregard for sacred sites in North Dakota, so they continue to ignore pleas to protect sites in far West Texas. 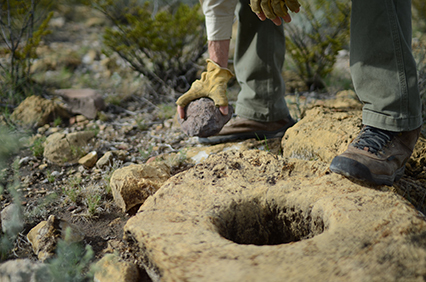 One that has brought this issue to a head is the Trap Spring site on the eastern front of the Davis Mountains -- a site so significant that it qualifies for the highest honors bestowed upon archeological sites in the state. Despite this and the fact that the pipeline company's own archeologist recommended avoidance, the company has failed to re-route the pipeline away from the site. As a result, Trap Spring may lose precious features and artifacts in addition to stripping its eligibility as a State Archeological Landmark for which it has been nominated. This is happening just as a media storm has erupted regarding the Sioux Indians fighting yet another ETP pipeline in North Dakota. 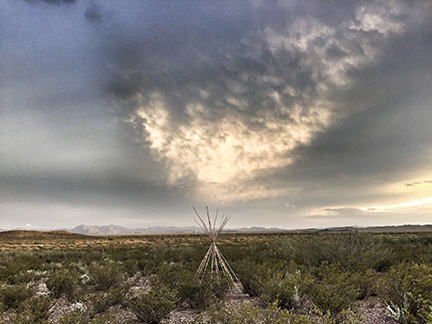 Because we have few First Nations remaining in Texas, the only people remaining here to protect this site are the ranchers, conservationists, and archeologists who fully appreciate its value. Captain Frank Jones, a famed Texas Ranger, said of his company’s top sergeant, Baz Outlaw (1854-1894), “A man of unusual courage and coolness and in a close place is worth two or three ordinary men.” Another old time Texas Ranger declared that Baz Outlaw “was one of the worst and most dangerous” because “he never knew what fear was.” But not all thought so highly of him. In "Whiskey River Ranger", Bob Alexander tells for the first time the full story of this troubled Texas Ranger and his losing battle with alcoholism. In his career Baz Outlaw wore a badge as a Texas Ranger and also as a Deputy U.S. Marshal. He could be a fearless and crackerjack lawman, as well as an unmanageable manic. Although Baz Outlaw’s badge wearing career was sometimes heroically creditable, and at other times his self-induced nightmarish imbroglios teased and tested Texas Ranger management’s resoluteness. 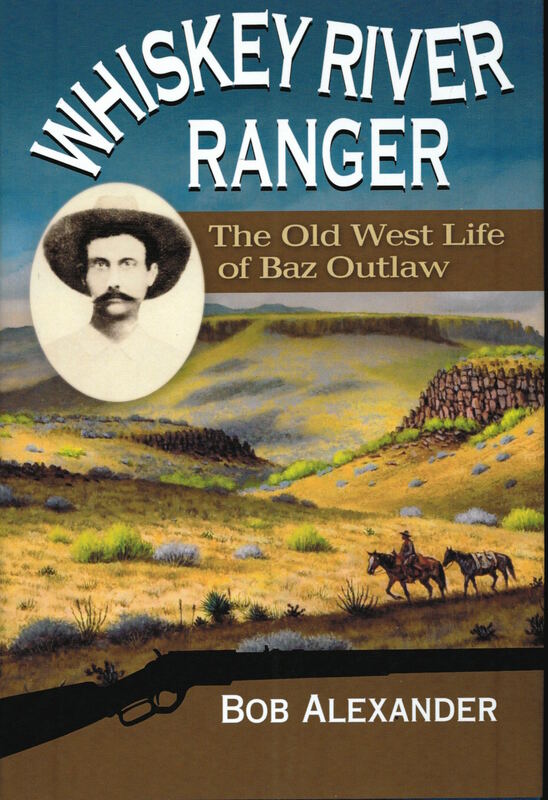 Baz Outlaw’s true-life story is jam-packed with fellows owning well-known names, including Texas Rangers, city marshals, sheriffs, and steely-eyed miscreants. Baz Outlaw’s tale is complete with horseback chases, explosive train robberies, vigilante justice (or injustice), nighttime ambushes and bushwhacking as well as episodes of scorching six-shooter finality. Baz met his end in a brothel brawl at the hands of John Selman, the same gunfighter who killed John Wesley Hardin”. Author Bob Alexander is a retired lawman himself. He began his policing career in 1965 and retired as a special agent with the U.S. Treasury Department. 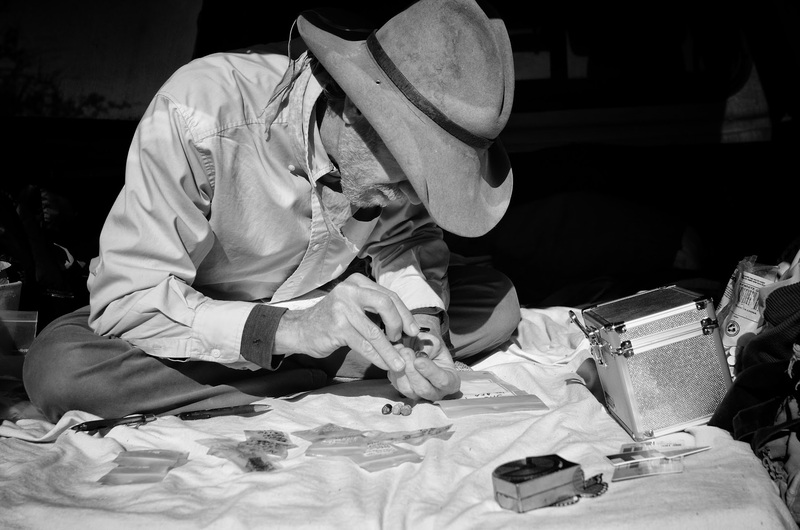 He is author of “Rawhide Ranger, Ira Aten” (winner of WWHA Best Book Award); “Six-Shooters and Shifting Sands”, “Bad Company and Burnt Powder”, “Riding Lucifer’s Line”, and “Winchester Warriors” all published by UNT Press. He lives in Maypearl, Texas. Also my article about the recent archaeological work just ran in second quarter Cenizo Journal. My friend Lonn Taylor published an article in the Big Bend Sentinel about the Porvenir archaeological dig titled "Uncovering The Truth About The Porvenir Massacre". Be sure and click on the adobe acrobat best price audio link for the whole story. Many thanks to Tom Michael! One January night in 1918 a mass murder took place in far northwest Presidio County, Texas. It happened not far from a tiny, little known village called Porvenir. In Spanish, Porvenir means future however there was no future for the some 140 Mexicans living there at the time who subsisted by farming, raising goats, sheep, a few cattle and horses. They lived in crude huts called jacales constructed with stone or adobe walls and thatched roofs of ocotillo. While some were U.S. citizens many of the residents of Porvenir came to Texas trying to escape the terrible civil war that consumed Mexico during those years. Porvenir had a school and a cotton gin but no store and the nearest church was located just across the Rio Grande in nearby Pilares, Chihuahua. Beginning in 1910 and lasting for a decade, the Mexican revolution created havoc in Mexico as well as along the Texas and New Mexico border. As many as a million people lost their lives or simply disappeared during this war. Bandit raids along the border became more and more common. On March 9, 1916 Pancho Villa led some 500-mounted horseman in an attack on Columbus, New Mexico that killed 18 Americans and left the business district of the little town in ashes. As a result, President Woodrow Wilson ordered General John “Blackjack” Pershing and four regiments of cavalry supported by two regiments of infantry into Mexico to kill or capture Villa. The expedition ended in failure about a year later after the elusive Villa simply vanished into the Sierra Madre. A few months after the Columbus raid President Woodrow Wilson deployed more than 100,000 National Guard troops to guard the Mexican border. On May 5, 1916 as Pershing’s army hunted for Villa another group of bandits attacked Glenn Springs, Texas located in today’s Big Bend National Park. The raiders killed three troopers of the Fourteenth Cavalry and a four-year-old boy and set Glenn Springs ablaze. On Christmas Day, 1917 some 45 raiders thought to be Villistas attacked the Brite Ranch located near Capote Mountain in western Presidio County. They looted the Brite store and hung mailman Mickey Welch from the rafters before cutting his throat to make sure they had killed him. All of this violence spread terror among Big Bend residents. Large numbers of people left their border homes seeking safety in Marfa and other west Texas towns. There were heated demands for retaliation. Sadly these demands for vengeance developed into reality and revenge descended upon the people of Porvenir who had nothing to do with any of these raids. Shortly after after midnight on January 28, 1918 some forty U. S. cavalry troopers of Troop G, Eighth Cavalry commanded by Captain Henry H. Anderson along with about ten or more Texas Rangers and a group of ranchers surrounded Porvenir in the darkness of a freezing cold night. Some of the ranchers wore bandanna masks to hide their identities as they awoke the townspeople and ordered everyone outside where someone built a fire. According to several witnesses, the soldiers sat atop their horses and did not dismount simply sitting around the village so no one could escape. The Rangers started separating the men from the women. They selected 15 men and boys with ages ranging from 16 to 72 years and marched them off into the darkness. Not long after this many gunshots rang out in the darkness as the fifteen victims were shot to death without ceremony. The sound of gunfire produced instant pandemonium in the village as the survivors in the village realized that something dreadful had taken place. Fearing the worst no one dared to venture out into the darkness to see what had happened. Sometime before dawn thirteen-year-old Juan Flores made his way to school master Harry Warren’s house north of Porvenir to report the shooting. Young Flores was lucky to be alive. Someone grabbed him the night before and shoved him into to the group to be killed. But a rancher said the Flores boy was too young and somehow got Juan released before the killing took place. The following morning Juan accompanied the schoolmaster to a place south of Porvenir until they came across a pile of bodies guarded by the soldiers. It was a ghastly scene. According to Juan Flores, the bodies appeared to have been tied together and shot so many times they appeared to have been purposely mutilated. Juan saw his father’s body. Longino Flores was almost unrecognizable to his son since part of the man’s head had been blown away. At some point that morning an old woman crossed the Rio Grande from Pilares driving a cart. The soldiers helped her load the bodies on to the cart and she took them to Mexico where they were buried in a mass grave in the Pilares churchyard. 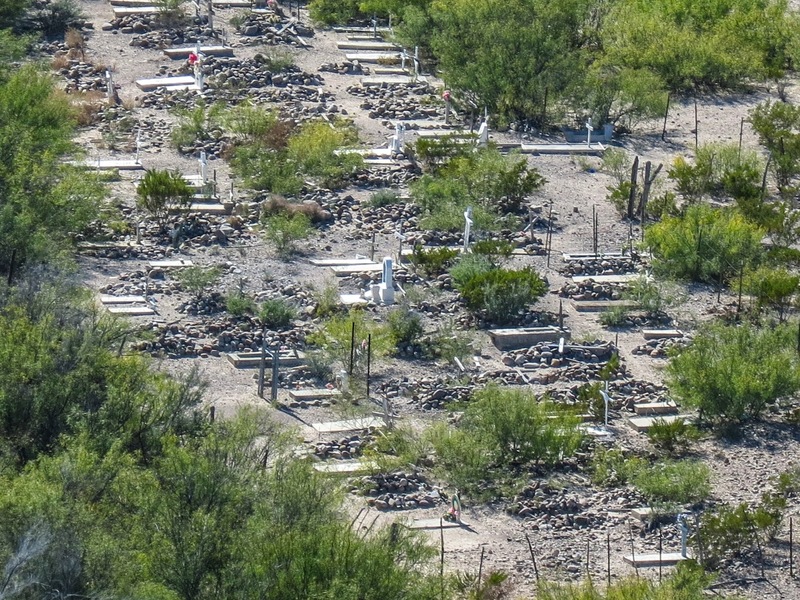 Above is photo of Pilares, Chihuahua graveyard where Porvenir massacre victims were buried in a mass grave. The survivors fled the place, some going to Mexico and other locations. A few days after the massacre, a contingent of troopers from Camp Evetts came to Porvenir and knocked down and burned the abandoned jacales the people of Porvenir once called home. The village ceased to exist. Texas Ranger Captain Monroe Fox commander of Ranger Company B attempted to whitewash the massacre waiting some three weeks before he even filed a report of the event. The captain claimed his men had gone to Porvenir in search of bandits and when they arrived came under fire from the brush. They returned fire and the next morning found fifteen dead bodies. Captain Anderson of Troop G Eighth Cavalry reported that his men came upon the bodies the morning after the massacre and had no idea how they had been killed. A few, very few newspaper articles about the massacre ever went to press but in June 1918 Governor William B. Hobby fired five of the rangers who had been at Porvenir and disbanded Company B. Captain Fox and several other rangers resigned but no criminal actions were ever taken against anyone for the crime. Glenn Justice started researching the story of the massacre in the late 1980’s and presented a paper about it about it to the West Texas Historical Association before publishing his book “Revolution On The Rio Grande” that included a chapter on the massacre in 1992. My research took me as far as the National Archives in Washington D. C. and Suitland, Maryland where Justice used the Freedom Of Information act to obtain vital previously classified army documents about the massacre. Slowly the paper evidence concerning the massacre grew to the point that it left little or no doubt that the massacre had actually taken place and who had been involved. Only one vexing question remained; that being who had actually done the killing the fifteen that tragic night? Then in the spring of 2002 Justice learned of a Porvenir survivor still living. His name was Juan Flores. At that time Mr. Flores was ninety-seven years of age but in good health and his mind still sharp. Remarkably, he did not even tell his family about the massacre until his last years. Mr. Flores suffered from terrible nightmares about the massacre that his family could not understand. Finally he decided to tell the story of what he had witnessed that awful night. In November 2002, Mr. Flores made a journey to Porvenir massacre site and revealed to those present the exact place where the killings took place. Remarkably some cartridge casings still lay on the ground and metal detectors indicated the presence of many more at the site. Justice picked up a few and over the next decade returned to Porvenir many times after that and each trip found more and more cartridge cases, bullets, bullet fragments and other artifacts. 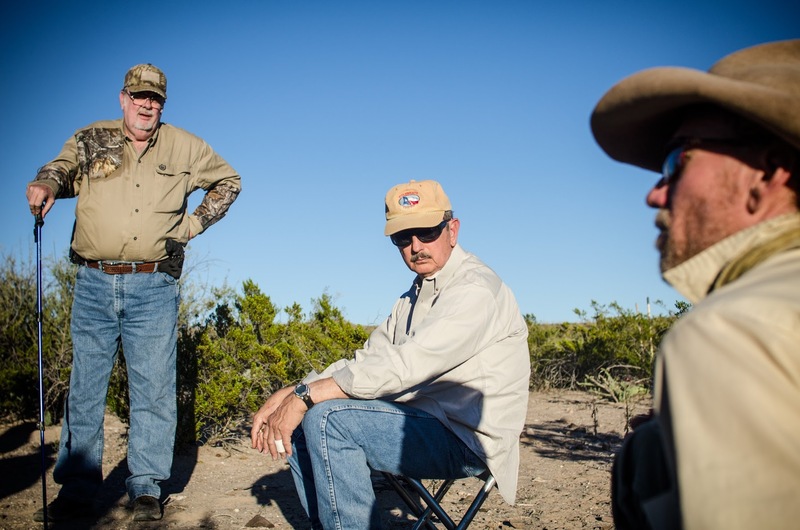 In 2015 former Texas Land Commissioner Jerry Patterson and Austin lobbyist Lee Woods offered their help with the Porvenir project. All ll felt it important that the little known Porvenir massacre story deserved being told and it would make a great topic for a documentary film. But, at the same time, realized that in order to accomplish this archaeological work had to be done at the massacre site. Also it was necessary to shoot at least enough video to put together a documentary film trailer to help us raise money to fund the project. Archaeologist and historian David W. Keller had long been familiar with the work at Porvenir and kindly agreed to help us assemble a team to investigate the site. David headed up the archaeologists who agreed to help with the work including Sam Cason, Tim Gibbs and Amber Harrison. In addition to being an archaeologist, Sam has expertise doing photographs with aerial drones that will prove to be most helpful in mapping some fifteen acres surrounding the massacre site. With the drone and the high-resolution photos it could make would allow us to map the location of each of the artifacts that were found. The archaeologists also planned an intensive five-acre metal detector survey on foot around the site. 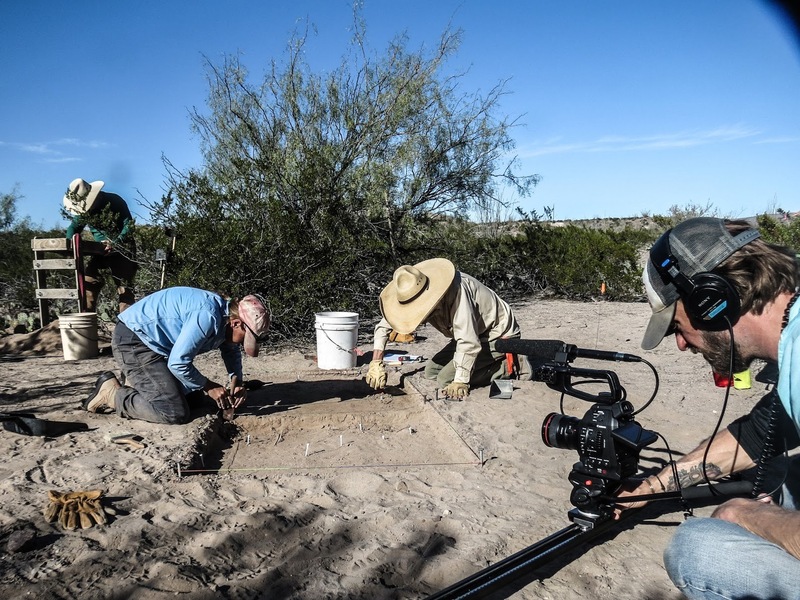 We employed the services of filmmaker Ford Gunter and his assistant Patton Baker to film archaeological work at the site, do interviews and also shoot aerial footage of the massacre site as well as the village of Porvenir and surrounding countryside. 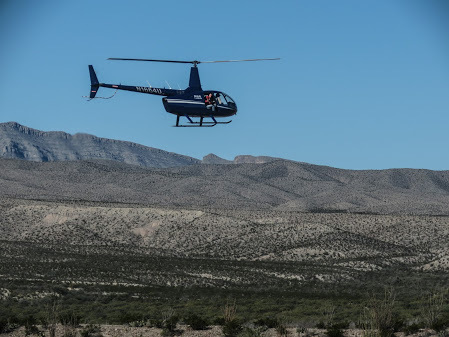 Stanley Jobe of El Paso was kind enough to provide a helicopter to do our aerial filming. On Friday, November 20, 2015 the Porvenir expedition set out for the site of the massacre. Because of the extremely remote location we had to camp for the next three nights. A cold front blew in and the first two nights plunging temperatures into the high 20’s with high winds. At first the expedition members didn’t think the helicopter could even fly in such conditions but fortunately by Sunday the weather cleared and could not have been nicer. The archaeologists unearthed 27 new artifacts, mostly bullets, bullet fragments and cartridge casings. Up to that date, I previously found 21 artifacts giving us a total of 48 artifacts. The cartridge cases and bullets found came in a number of calibers including 30.06, .45 Colt, and .45 acp. The head stamps on the cartridge cases are dated and most were manufactured by two United States Army ammunition manufactures. Some were made by the Frankfort Arsenal of Philadelphia, Pennsylvania that made ammunition for the U.S. Army from 1816 until it closed at the end of the Vietnam War. Other cartridge cases found at the massacre site had been manufactured by the Union Metallic Cartridge Company a division of Remington Arms that made rifle and pistol ammunition for the U. S. Army from the time of the Civil War. The head stamp dates on all of the ammunition ranged from 1909 to 1917. It should be noted that guns carried by most Texas Rangers during the time of the massacre were revolvers chambered in the .45 Colt caliber and 30-30 Winchester saddle guns. No .30-30 cartridge cases or bullets were found at the massacre site. Some U.S. Army troopers carried .45 caliber revolvers but generally the 1911 Colt Automatic Pistol were carried mainly by officers since the weapon was in short supply during the World War I years. 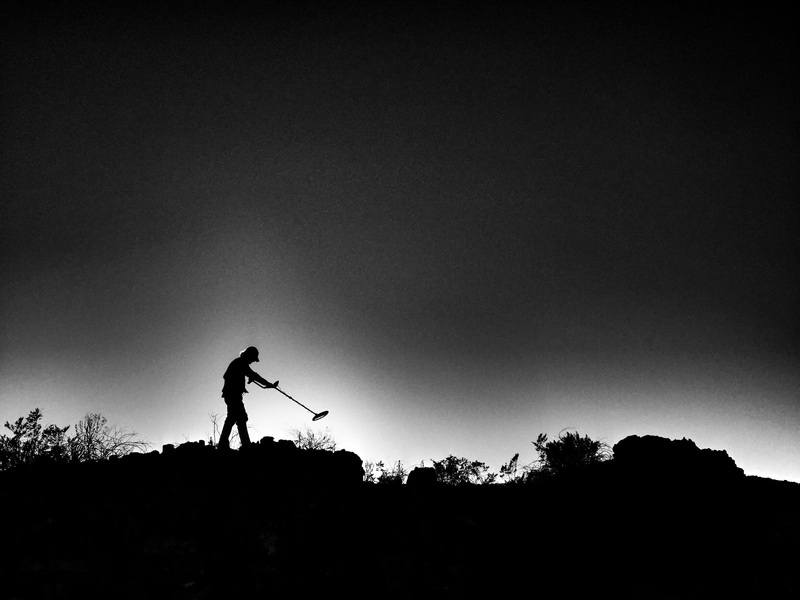 Overall everyone who took part in the archaeological work at Porvenir considered the finds to be exceptional. Principle archaeological investigator David Keller summed up the project “Considering that I was skeptical that we would find additional materials, I was pleasantly surprised by the volume and consistency of our finds. The intensive survey also revealed a highly patterned artifact distribution. I can say with a fair degree of confidence that the artifactual distribution, the types of artifacts, all strongly conform to the hypothesis that this was the site of the Porvenir Massacre of 1918. The findings also strongly implicate the U.S. Cavalry.” Our next step is to have the artifacts carefully examined by an expert skilled in ballistic analysis. 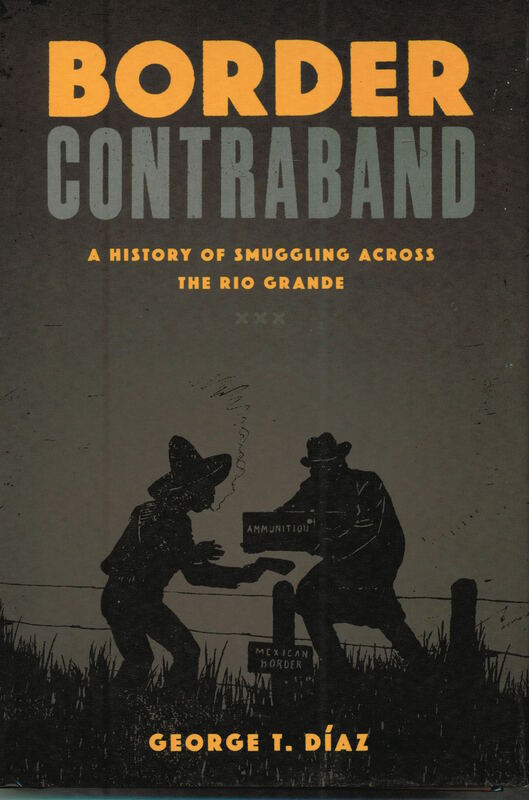 Professor George T. Díaz of Sam Houston State University offers a well researched historical study of smuggling along the Texas-Mexican border. The work focuses on Laredo, Texas as well as its Mexican sister city across the Rio Grande, Nuevo Laredo. The author points to the importance of the two Laredos with Nuevo Laredo being the third largest port in Mexico and Laredo, Texas the number one inland entry port on the U.S.-Mexican border. The vast Pan American Highway system runs through both ports and Laredo, Texas today is situated on the southern end of Interstate 35. Since 1882 Laredo, Texas has been linked by railroad service making its location ideal for anyone, including smugglers, who wish to travel throughout the United States or Latin America. Díaz did well choosing this location for his research. Smuggling on the Texas border is a worthy historical topic but one not previously given a great deal of attention largely because of the illegality of the subject. Also, it is one not easily researched because of this unlawfulness. The author breaks his work into three time periods beginning in 1848 with the Treaty of Guadalupe Hidalgo that ended the Mexican-American War and designated the Rio Grande as an international boundary. Professor Díaz details this first period that ends with the outbreak of the Mexican revolution in the first decade of the twentieth century as a time in which both Mexican and U. S. customs enforcement concentrated on the collection of tariffs needed provide essential revenue to both countries. The author points out the attitude of border residents during these years as being a tolerant acceptance of smuggling. This began to change with the coming of the railroads in the 1880’s that spurred population growth particularly on the Texas side. The outbreak of civil war in Mexico in 1910 brought violence with enforcement of arms and ammunition embargos imposed to stop the southward flow of the weapons of war into Mexico from the United States. U.S. Customs agents, once primarily collectors of revenue, found the enforcement of neutrality laws designed to keep illegal arms out of Mexico a very dangerous business. The author does not ignore abuses during the era of prohibition when Customs agents and Texas Rangers resorted to ambush and murder of armed tequileros (tequila smugglers). By 1928, the two Laraedos became a transit point for drug traffickers who took up the smuggling of opium because it could be easily concealed in automobiles and in various types of shipments. Díaz makes use numerous case studies to illustrate his points. The professor’s research is thorough and innovative. He presents an impressive bibliography of archival and manuscript collections as well as scholarly articles and secondary sources. He also uses Mexican corridos (songs as sources) to broaden the readers understanding. It is a work well done and worthwhile.